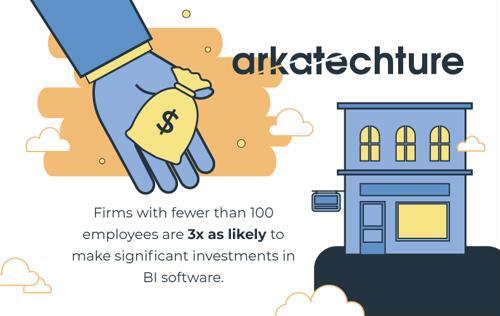 Firms with fewer than 100 employees are 3X as likely to make significant investments in business intelligence. For many organizations, the potential benefits associated with adopting a software platform like Tableau seem daunting when weighed against the burdens of integration, deployment and most importantly, user adoption. These variables pose a particularly significant challenge to small businesses, many of which do not have the time needed to implement complex enterprise IT solutions without some help. In these situations, finding an implementation partner can be critical to the success of the project. Although Tableau is a complex and powerful business intelligence and data visualization platform, it requires careful planning and execution on the back end to achieve the desired results and performance expectations. Effectively rolling out a solution like Tableau is more difficult than it may seem. While organizations can download the software and purchase licenses on their own, connecting multiple data sources and building dashboards that load quickly can become challenging as your data sets grow in size and complexity. For example, more powerful services such as Tableau Server require constant maintenance and IT oversight to keep them running smoothly. On top of this, the sheer number of data source integration tools may leave small to medium sized businesses overwhelmed with options and customization settings. These decisions require technical knowledge and systems-specific experience that most enterprises - even the larger ones - cannot find in-house. Many businesses are turning to experienced managed service providers to assist with the entire Tableau implementation process - an essential exercise that lays the foundation for success. Tableau is among the easiest data visualization platforms to navigate on the market once it is setup properly. It offers intuitive features that most users can pick up over the course of two or three sessions. However, organizations implementing this powerful tool should provide end users with the hands on training they need to get the most out of the software in an efficient manner. Unfortunately, the vast majority of Tableau adopters either do not know the best practices or lack the institutional experience to provide effective training. Integration partners, on the other hand, specialize in preparing users for their future work with Tableau. A Tableau Partner can help develop and deploy engaging learning material and exercises to generate excitement and ultimately empower users whether they are analysts or c-level executives. Without proper training, user adoption within the company may fall short of your expectations. Getting hands on experience utilizing real company data and business use cases provides a path for users to become Tableau Champions! Since Tableau is primarily a data visualization tool, many companies focus on the pretty pictures aka the front end user interface - sometimes to a fault. Transforming raw information into visually pleasing charts, graphs and interactive dashboards improves decision making capabilities, but doing so without understanding the original data sources and how they flow into Tableau can lead to bad information. To avoid this kind of outcome, Tableau adopters must evaluate their data storage and system integration methods to ensure all of the information fed into the platform is timely and accurate. This requires a lot of time and effort combined with the knowledge of proven data management best practices; insight that only dedicated business intelligence professionals have mastered. Businesses navigating the Tableau implementation journey would be wise to consider an integration partner to cultivate technically sound, highly organized and user-friendly data visualization workflows that directly impact an organization's goals and key performance indicators. Here at Arkatechture, we leverage decades of Tableau experience to guide companies of all sizes through this process and work with users to help them make the most out of their new tool kit. We customize our services and offerings to your needs because no two implementations are exactly alike. Interested in embracing data visualization and integrating Tableau into your operations?